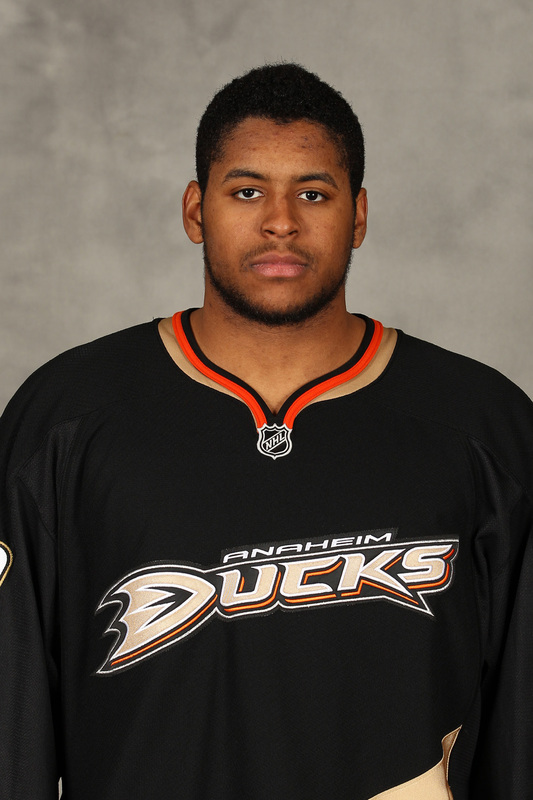 Devante Smith-Pelly only scored two goals and 10 assists in 19 games for the Anaheim Ducks last season. But the rugged 22-year-old right wing with the hyphenated last name made a name for himself in the 2014 Stanley Cup Playoffs, showing the power and promise of things to come. On a team loaded with scorers like Ryan Getzlaf and Teemu Selanne, Smith-Pelly topped the Ducks with five playoff goals in 12 games. Anaheim rewarded him Tuesday with a two-year contract with undisclosed terms. ESPN.com reported that the deal is worth $800,000 per season. With the contract negotiations behind him. Smith-Pelly said he can concentrate on having a good training camp and work towards becoming a regular top-six forward on the team. Ducks Head Coach Bruce Boudreau “shuffles the lines and, with the way I play, I can be successful on any type of line,” Smith-Pelly said. With the 2014-15 National Hockey League season just a few weeks away, I’d like to see and hear from hockey fans of color about your hockey experiences – as players young and old, as parents, as teams, as fans, whatever. I’d like to post your photos accompanied by a bit of information about you: how you got involved in the game, what you love about it, and who’s your favorite player. I’d, also like to know your predictions on which team will win the Stanley Cup, which player will win the scoring title, and who’ll be the league’s most valuable player. Once I get enough responses I’ll post the results, hopefully before the puck drops at the NHL’s first regular-season game next month. So don’t be shy, send your pictures and stories to colorofhockey3582@yahoo.com. I look forward to hearing from you. Mike Grier already has his strategy down for coaching a squad of some of the best 2015 NHL draft-eligible players born in the United States: just open the bench door and point them to the ice. Grier will test his coaching philosophy on September 25 when he serves as a bench boss at the CCM/USA Hockey All-American Prospects Game at the First Niagara Center in Buffalo, home of the Buffalo Sabres. Forty-two players who’ll be eligible for the 2015 NHL Draft will compete on teams coached by Grier – who played 15 seasons for the Sabres, Edmonton Oilers, Washington Capitals, and San Jose Sharks – and Eddie Olczyk, the lead hockey analyst for the NHL on NBC and NBC Sports Network. Olczyk played 16 seasons for the Chicago Blackhawks, New York Rangers, Toronto Maple Leafs, Winnipeg Jets, Los Angeles Kings, and Pittsburgh Penguins. He helped guide the Rangers to its Stanley Cup victory in 1994 and is a member of the U.S. Hockey Hall of Fame. A Detroit native and Boston University hockey standout, Grier was the NHL’s fourth U.S.-born black player. He followed Indiana-born forward Donald Brashear, Maine’s Mike McHugh, and Ocala, Florida’s Valmore James who became the NHL’s first African-American player when he debuted with Sabres in the 1981-82 season. James and Brashear were tough guys, on-ice enforcers known more for their fists than their scoring touch. Grier combined toughness with scoring. He was the NHL’s first African-American player to score more than 20 goals in a season. He finished his career with 162 goals, 383 total points and 510 penalty minutes in 1,060 games. These days, Grier is involved in coaching youth hockey coaching and he served as an on-ice instructor last month at USA Hockey’s Boys’ Select 17 Player Development Camp.